The US Army Corps of Engineers (Corps) prepared a Supplemental Environmental Assessment (EA) and Environmental Impact Report (EIR) Addendum for the Auxiliary Dike Project, located in the Prado Basin, Riverside County. The project was originally analyzed under the 1988 Phase II General Design Memorandum/Supplemental Environmental Impact Statement (EIS) and the 2001 Supplemental EIS/EIR. However, the design of the embankment was refined. Aspen provided technical assistance to the Corps and took the lead in drafting the Supplemental EA and EIR Addendum. The Auxiliary Dike has slope revetment consisting of 24-inch stone over 12 inches of bedding material. The design alignment is slightly modified to reduce impacts to riparian and coastal sage scrub vegetation. The Auxiliary Dike begins at the southeastern part of the Prado Dam spillway and extends somewhat parallel to SR-91, along the northern side of the Burlington Northern Santa Fe railroad track to Auto Center Drive. 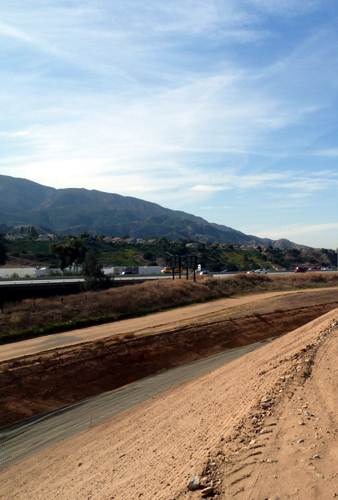 The dike then ties into the City of Corona’s proposed grade separation structure at Auto Center Drive. Across the road, a concrete floodwall is constructed that extends approximately 1,200 feet along the north side of the railroad tracks. The primary construction staging area for the project was located north of the Corps Prado Dam Offices and south of the borrow pit, approximately 800 feet north of the center of the project site. Construction equipment included a combination of concrete pumpers, water trucks, waste trucks, haul trucks, scrapers, loaders, dozers, cranes, soil compactors, rollers, graders, chippers, and excavators.